, a celebrated Greek philosopher, and the first of the seven wise men of Greece, was born at Miletus about 640 years B. C. After acquiring the usual learning of his own country, he travelled into Egypt and several parts of Asia, to learn astronomy, geometry, mystical divinity, natural knowledge, or philosophy, &c. In Egypt he met for some time great favour from the king, Arnasis; but he lost it again by the freedom of his remarks on the conduct of kings, which, it is said, occasioned his return to his own country, where he communicated the knowledge he had acquired to many disciples, among the principal of whom were Anaximander, Anaximenes, and Pythagoras, and was the author of the Ionian sect of philosophers. He always, however, lived very retired, and refused the proffered favours of many great men. 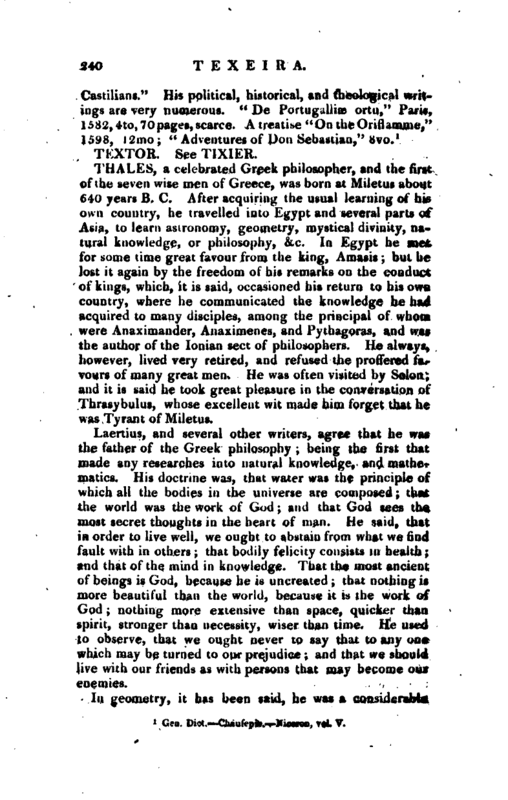 He was often visited by Solon; and it is said he took great pleasure in the conversation of Thrasybulus, whose excellent wit made him forget that he was Tyrant of Miletus. Laertius, and several other writers, agree that he was the father of the Greek philosophy; being the first that made any researches into natural knowledge, and mathematics. His doctrine was, that water was the principle of which all the bodies in the universe are composed; that the world was the work of God; and that God sees the most secret thoughts in the heart of man. He said, that in order to live well, we ought to abstain from what we find fault with in others; that bodily felicity consists in health; and that of the mind in knowledge. That the most ancient of beings is God, because he is uncreated; that nothing is more beautiful than the world, because it is the work of God; nothing more extensive than space, quicker than spirit, stronger than necessity, wiser than time. He used to observe, that we ought never to say that to any one which may be turned to our prejudice; and that we should live with our friends as with persons that may become our enemies. In geometry, it has been said, he was a considerable | inventor, as well as an improver; particularly in triangles. And all the writers agree that he was the first, even in Egypt, who took the height of the pyramids by the shadow. His knowledge and improvements in astronomy were very considerable. He divided the celestial sphere into five circles or zones, the arctic and antarctic circles, the two tropical ci ivies, and the equator. He observed the apparent- diameter of the sun, which he made equal to half a degree and formed the constellation of the Little Bear. He observed the nature and course of eclipses, and calculated them exactly; one in particular, memorably recorded by Herodotus, as it happened on a day of battle between the Medes and Lydians, which, Laertius says, he had foretold to the lonians. And the same author informs us that he divided the year into 365 days. 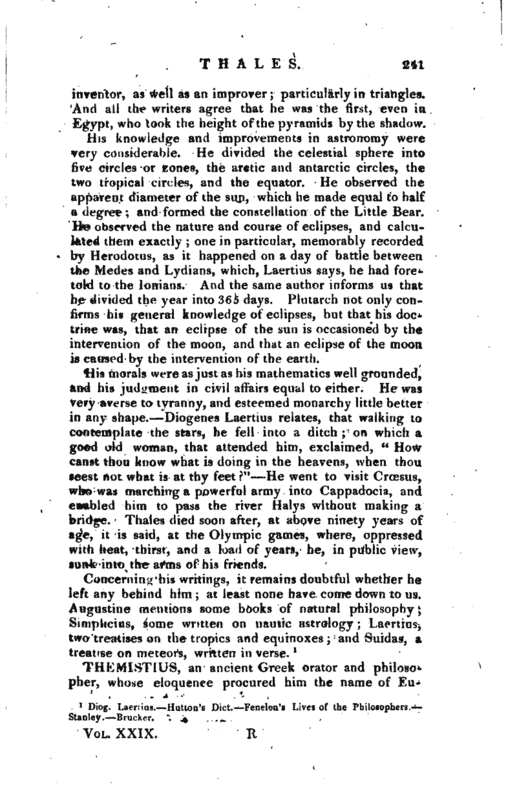 Plutarch not only confirms his general knowledge of eclipses, but that his doctrine was, that an eclipse of the sun is occasioned by the intervention of the moon, and that an eclipse of the moon is caused by the intervention of the earth. His morals were as just as his mathematics well grounded, and his judgment in civil affairs equal to either. He was very averse to tyranny, and esteemed monarchy little better in any shape. Diogenes Laertius relates, that walking to contemplate the stars, he fell into a ditch; on which a good old woman, that attended him, exclaimed, “How canst thou know what is doing in the heavens, when thou seest not what is at thy feet?” He went to visit Croesus, who was marching a powerful army into Cappadocia, and enabled him to pass the river Halys without making a bridge. Thales died soon after, at above ninety years of age, it is said, at the Olympic games, where, oppressed with heat, thirst, and a load of years, he, in public view, sunk into the arms of his friends. Diog. Laertius.—Hutton’s Dict.—Fenelon’s Lives of the Philosophers.— Stanley.—Brucker.